Improving border roads and customs administration can help landlocked countries integrate into regional and global markets. Photo credit: ADB. The landlocked country of Nepal faces a challenging geography that not only limits domestic commerce, but also presents a big roadblock to international trade. Nepal’s semi-isolated economy used to be highly dependent on long and challenging transit routes for imports and exports. Trade facilities and transit logistics that could make freight handling and transfers faster and easier were inadequate and inefficient. Customs clearance procedures and other cross-border inspections were cumbersome and time-consuming. The passage of goods was further delayed by the traffic congestion at border crossings and the poor condition of many access roads. Nepal needed to remove these roadblocks by improving its transport system and trade facilities to better integrate into regional and global markets. With half of Nepal’s total border length shared with India, its largest trading partner, much of Nepal’s imports and exports, including those to and from its neighbors Bangladesh and Bhutan, pass through India. India is also Nepal’s top export destination, though its goods reach as far as Europe and North America. Asia, meanwhile, is the major source of Nepal’s imports, but much of this is entrepot trade moving through Singapore and Hong Kong. Nepal also imports goods from the People’s Republic of China (PRC) and the United Arab Emirates. Within Nepal, about 90% of all freight are transported through the country’s road network. 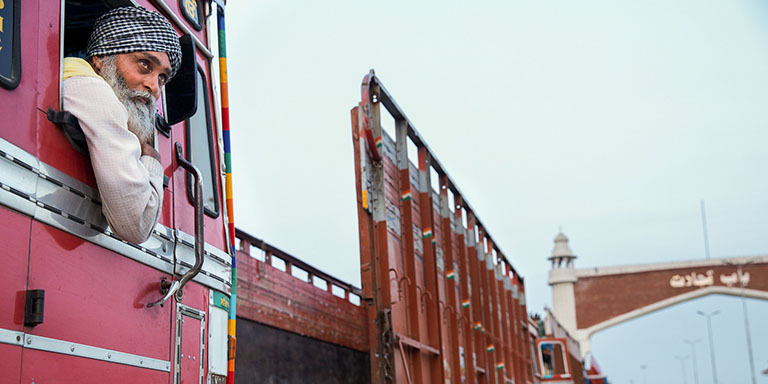 Large amounts of goods pass through five major border crossings with India, either by road or rail. These are Bhairahawa, Birgunj, Birgunj Dryport, Biratnagar, and Kakarbhitta. Birgunj is the country’s most important trade border, where 50% of the country’s trade passes through to the capital Kathmandu. The country only has one international airport and the nearest seaport is 752 kilometers away in Kolkata, India. To support trade, Nepal relies highly on India’s road and rail network and on seaports in Bangladesh or India. Cargo transported by rail or road is processed in either one of Nepal’s three inland clearance depots at Birgunj, Biratnagar, and Bhairahawa. These depots take on part of freight handling and storage from seaports and other border crossings to expedite import-export processing. In 2004, the Asian Development Bank (ADB) approved the Subregional Transport Facilitation Project to assist the Government of Nepal in integrating the country’s economy into the South Asian and global markets. The project was an integral part of the ADB-supported South Asia Subregional Economic Cooperation (SASEC) Program that promotes trade, connectivity, and cooperation among countries in the South Asia subregion. ADB’s Subregional Transport Facilitation Project removed roadblocks to Nepal’s trade by updating the customs administration software, constructing a new inland clearance depot, and rehabilitating border access roads. The project updated the Automated System for Customs Data (ASYCUDA) software that speeds up cargo clearance and simplifies customs documentation and procedures. Developed by the United Nations Conference on Trade and Development (UNCTAD), ASYCUDA manages huge amounts of customs data and performs various customs-related functions. It is a computerized customs management system, which covers most foreign trade procedures, and handles manifests and customs declarations, accounting procedures, and transit and suspense procedures. ASYCUDA is used in over 90 countries, territories, and regions. An upgraded version of the software, ASYCUDA++, was installed and customized for Nepal, which includes considering customs procedures, rules, and regulation. ASYCUDA++ introduces a new Selectivity Controls Module, which is an essential element of risk analysis for a specific customs office. The module uses customs declaration data and other information to identify goods or transactions of particular interest to customs, such as those that may present risks to national objectives, including risks to the collection of duties or taxes or to the enforcement of customs controls. The module was installed in five key customs offices, instead of the originally planned 10 customs offices. The steering committee at the Department of Customs decided to implement the Selectivity Control Module only in those customs offices where adequate support was available, including intelligence arrangements. A risk management structure was adopted in 2009 with the appointment of a risk management team in the Department of Customs and in the customs offices at the Tribhuvan International Airport, Birgunj Customs, and Birgunj Inland Clearance Depot. The Customs Broker Module, which facilitates direct trade inputs, was also installed in three customs offices. Aside from the customs software upgrade, the project also installed a wide area network and related telecommunications and computer equipment. Network equipment and communication software for the wide area network were procured, installed, and operationalized at all 10 customs offices. This paved the way for the Department of Customs to consolidate data from all customs offices into comprehensive and accurate trade and revenue statistics. Eight separate training sessions on ASYCUDA++ were conducted for the Department of Customs staff. Training on the use of the Selectivity Controls Module was provided to the national project team at the Department of Customs and to the customs staff in each office where the module was deployed. Additional training for the Customs Broker Module was provided to 10 separate groups, including would-be-trainers, customs staff, information technology experts, and brokers and traders from different border customs areas. Training was also conducted on wide area network operation and troubleshooting for the technology staff of each customs office. Some difficulties arose in contract administration between the Department of Customs and UNCTAD, especially since the contract did not have clear provisions on the role and responsibilities of the Department of Customs. While the Department of Customs carried out the activities related to ASYCUDA++ and the wide area network, the contract was drawn up and signed by UNCTAD and the Department of Roads, which supervised the overall project implementation and had considerable experience with ADB-financed projects. The Department of Roads is under the Ministry of Physical Planning and Works, which is the executing agency for the project. The project financed the construction of a new inland clearance depot at Kakarbhitta on the eastern border of Nepal. The depot is a 7.5-hectare complex with a three-story main building, two goods inspection sheds, immigration offices, a warehouse, a litigation shed, passenger terminal, staff quarters, and an 18,800-square meter container platform. The design standards of these facilities comply with the requirements of Nepal’s National Building Code. The Kakarbhitta Inland Clearance Depot was built on public land, thereby avoiding any issue on land acquisition. The operation of the depot was expected to be handed over to a private terminal management company at least 3 months before completion. With the lack of interested companies, management of the depot was handed over to the Nepal Intermodal Transport Development Board. Construction began in November 2007 and was completed in June 2010. Delays in the construction of the depot were mainly due to political unrest in the eastern Terai region and a sudden rise in the cost of construction materials. As price adjustments were not covered by the civil works contract, the contractor became unwilling to continue construction works. ADB later approved the introduction of a price adjustment clause in the contract. Minor variations of about 13.5% of the contract amount were incurred for additional drainage works, landscaping, and construction of false ceilings in staff quarters. About 41 kilometers of roads were constructed or rehabilitated to unclog traffic in Birgunj and Bhairahawa: the 12.4-kilometer two-lane Birgunj access road connecting the Birgunj Inland Clearance Depot to Tribhuvan Highway and the 29-kilometer-long Bhairahawa access road connecting the Bhairahawa Inland Clearance Depot to Bhumahi on the East–West Highway leading to Kathmandu and other parts of Nepal. The access roads have a 7.5-meter carriageway. Minor rehabilitation works included widening of a 600-meter road near Birgunj Inland Clearance Depot and a 1.48-kilometer road in Jeetpur township. The national highway design standard was adopted in the design of all roads sections, using low-cost double bituminous surface treatment. Rehabilitation of a part of the Bhairahawa access road was delayed by 6 months due to the late implementation of resettlement activities. Overall, ADB’s Subregional Transport Facilitation Project has allowed for the easier, faster, and smoother flow of tradeable goods into and out of Nepal. The cost of capital for cargo is reduced by 12% annually. Through the project, Nepal is now better connected to the subregional economy. The installation of ASYCUDA++ modules and the wide area network, along with the adequate training of the Department of Customs staff, has substantially increased the efficiency in cargo clearance and management. ASYCUDA++ is operational in 10 customs offices covering over 90% of the trade between Nepal and India. The system is the backbone of revenue processing and generation after the project-supported upgrades, including the broker and selectivity modules. The Department of Customs fully owns the system and has institutionalized it by providing the necessary human and financial resources. The Selectivity Controls and Customs Broker modules have reduced paper processing and inspection times, and cargo dwell times. Average cargo clearance time in major customs offices has been reduced from about 3.5 hours to about 40 minutes. The construction of the Kakarbhitta Inland Clearance Depot filled in the crucial gap in the development of cross-border facilities in Nepal, particularly in the eastern gateway, which accounts for about 13% of the country’s trade with Bangladesh, Bhutan, and India. The new depot offers more customs facilities for both passengers and freight, and facilities for the immigration department. The new facilities have shortened the time needed to inspect passengers’ papers and luggage. Risks of theft and damage to cargo have been reduced. The ASYCUDA++ modules and wide area network were also installed in the Kakarbhitta Inland Clearance Depot, which made customs and cross-border procedures faster and more efficient. With better pavements on the newly constructed or rehabilitated access roads, travel time and vehicle operating costs have been substantially reduced, thereby lowering the cost of transporting export and import goods. The average road user cost per vehicle was reduced by 23.1% on the Bhairahawa access road and by 20.5% on the Birgunj access road. The road upgrade at Bhairahawa has shortened the route to the East–West Highway from 41 kilometers to 29 kilometers, while the Birgunj route was shortened by 0.88 kilometers and significantly reduced traffic congestion. The two access roads are now part of the strategic highways in the country. The toll for these roads will contribute to funds for routine and recurrent road maintenance. ADB’s Subregional Transport Facilitation Project is more than just a transport project in that its aim is to improve trade and transport logistics performance to remove roadblocks to international trade. As such, it requires coordination among all relevant government agencies and stakeholders. The Department of Customs felt that the UNCTAD contract implementation could have been more effective if they were a party to the contract. The department’s involvement in contract preparation could have resulted in a more detailed terms of reference to meet the specific needs of the department, particularly regarding the training of customs staff on ASYCUDA++ and the wide area network. This lesson proved useful in ADB’s Subregional Transport Enhancement Project, which is further upgrading ASYCUDA++ to the latest version, ASYCUDA World. Under this project, the contract was signed between UNCTAD and the Department of Customs as the implementing agency. Kenichi Yokoyama has served as ADB’s Country Director in India since 2017. Prior to his current appointment, he was Country Director in Nepal. Mr. Yokoyama also worked with the South Asia Department where he was responsible for developing water resources projects in South Asian countries including Bangladesh, India, and Nepal. Prior to joining ADB, he worked with the Government of Japan for about 16 years in various capacities. He has degrees in agricultural engineering and agricultural economics.